Free Seats for All - Publisher, book packager and consultancy firm. By 1815, only half the population of England belonged to the established Anglican Church. Faced with a rapidly growing population in the new industrial towns, the growth of Nonconformism and the fear of revolution, the Church of England set about building and enlarging churches. An astonishing number of churches were built and hundreds of thousands of new spaces provided in parish churches in the years after Waterloo. Much of this work was carried out thanks to the the Incorporated Church Building Society (ICBS). Backed by Hoares Bank, the ICBS, in contrast to the government-supported Church Building Commission, raised the funds it needed for church building and enlargement privately. The ICBS’s funding contributed to adding over two million pew spaces most of which were free seats for all, in contrast to the then customary provision of private pews and reliance on pew rents. 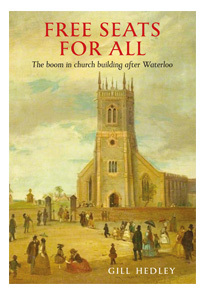 The story of church building after Waterloo is full of fascinating detail about the people who helped set up the ICBS and about the thousands of churches supported by its grants. It is a highly readable and attractive account of an extraordinary moment in 19th-century church architecture which still resonates in the 21st century when arguments rage as to whether there are too many, rather than too few, churches in England. Gill Hedley is a freelance curator and author. She was director of the Contemporary Art Society, 1993–2006, and has worked for the British Council and various regional museums. She has produced exhibitions and publications on subjects ranging from Capability Brown to the Great Liners, Epstein to Pop Art. She writes regularly for the Oxford Dictionary of National Biography. The National Churches Trust is handling publicity and reviews and expects coverage in the religious and mainstream newspapers and author interviews. Vine House Distribution Ltd. Has world rights.